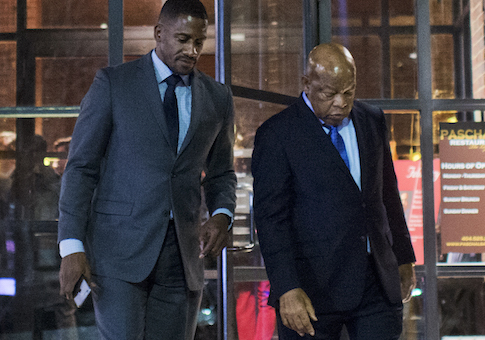 A watchdog group is asking congressional ethics officials to investigate Rep. John Lewis (D., Ga.) and his chief of staff over apparent violations of House ethics rules, according to a letter released on Monday. The Foundation for Accountability and Civic Trust's letter is asking the Office of Congressional Ethics to probe Lewis chief of staff Michael Collins' dual roles in the congressman's Washington office and as the treasurer for his 2016 reelection campaign. Ethics rules bar senior House staff from serving in any fiduciary role for a political organization, and specifically mentioned campaign treasurers as a prohibited position for such staffers. FACT's complaint doesn't just target Collins; it claims that Lewis himself is culpable for ethics violations by his top staffer. "In this case, not only did Collins directly violate these rules, but Representative Lewis also violated the ethics rules because his own campaign employed Collins in a prohibited position and paid him a prohibited salary," FACT wrote in its letter to OCE. The Washington Free Beacon first reported on Collins' dual roles. In his personal financial disclosure statement for 2015, he reported $27,495 in income from the campaign. The House Ethics Committee previously sanctioned Collins for failing to disclose or pay taxes on more than $50,000 in income from Lewis' campaigns. He has been paid by the campaign for work going back to 2002, though he did not serve as treasurer until the 2016 cycle. Collins' campaign income for each year since 2012 was exactly or almost exactly the limit for senior staff outside income set by House ethics officials for those years. "The outside employment ethics rules are based on fundamental and important principals that require enforcement to maintain the public's trust," FACT wrote on its complaint. "Therefore, we urge the Board to immediately investigate and take appropriate action in response to this violation of the House Ethics Rules." FACT executive director Matthew Whitaker, a former U.S. Attorney, said in an interview that he believes the OCE will find "a very clear violation of not only the letter but the spirit of the rules." Whitaker did not say what specific action he hoped OCE would take, or what sanctions he felt would be in order, but noted, "There's a lot of room, ultimately, for the ethics committee to take action." The OCE recently survived congressional efforts to disband the office, which some Republicans said is prone to politically motivated leaks and erodes due process for members accused of wrongdoing. They walked back the move after an outcry from congressional Democrats. Whitaker urged the OCE to vigorously pursue his complaint, lest ethics rules be seen as toothless. "If you're going to pass these types of rules, then members of Congress of their staff should be aware of them and follow them, and not just err on the side of compliance," he said. Lewis' office did not immediately respond to a request for comment.